"You're forgetting one thing. Make that three things. On each hand. So, six things total." Characters that fight with multiple blades attached to their hands or fingers to emulate gigantic metal claws. The blades can be a natural part of their body, artificial implants, stuck on a glove or gauntlet, or actually be a variation of bladed brass knuckles. Wolverine Claws on a good guy is used to demonstrate Exotic Weapon Supremacy; on a bad guy they show that he or she is especially bloodthirsty and likely Ax Crazy. Any character sporting these will be improbably effective with them. When these weapons are unsheathed, they often make a distinct "snikt!" noise or some variant. Weapons of these type are presumably easier to conceal and use in close quarters, depending on the size and nature of the blades. However, in fights involving larger weapons they would be less effective considering their limited reach compared to a sword or polearm. Weapons of these type were actually used in early civilizations. The Bagh Nakh, or Tiger's Claw, was developed in India for self-defense and used by the first Maratha Emperor Shivaji. Ninjas also used Nekode [dead link] (Cat's Paw) for fighting and Tekagi-Shuko for utilitarian purposes, such as climbing trees. 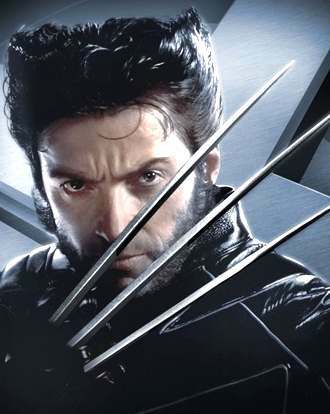 Artificial Limbs and Swiss Army Appendages may be modified to feature Wolverine Claws. Subtrope of Blade Below the Shoulder. Due, from Magical Girl Lyrical Nanoha StrikerS, uses a clawed glove similar to Freddy Krueger's. Sora from Naruto uses one of these. Captain Kuro, one of the first antagonists of One Piece. Notably, they're not just small claws, but gloves that have entire swords on each finger. Blackbeard was seen with one in a flashback during the Fishman Island Arc. Also the probable way he scarred Shanks in their fight years ago. Lucario's Metal Claw attack in the Pokémon anime. In Rurouni Kenshin, Hanya from the Oniwabanshu also has claws like them as his secret weapon. They're even based on Wolverine's claws. Nobuhiro Watsuki is a Jim Lee fan. Hidaka Ken in Weiss Kreuz uses modified bagh nakh, gloves with retractable blade claws built in. Ciel from Tsukihime, although they're not claws so much as they are three long knives in each hand, wedged between her knuckles. They're only part of Mousse's enormous arsenal in Ranma ½, but received particular attention in the second movie. Lust from Fullmetal Alchemist, though she's turning her fingers into spears instead of having them come out of her hand. Wargreymon from Digimon has these in the form of 'Dramon killers'. They are Super Effective against dragons including himself if he's not careful. Most of His subspecies has some variation on them. Nao from My-HiME uses the fingernail-claw variety. Saint Seiya: Hydra Ichi and Docrates. Spade, an early opponent of Kenshiro from Fist of the North Star, had a particularly long set of these as his Weapon of Choice, often licking the blood of his victims off them. He only gets one hit on Kenshiro with them before suffering the fate of all who mess with him. Overhaul of Transformers Cybertron has these. When he's upgraded into Leobreaker they become even deadlier. Chiffon from Freezing has a large clawed gauntlet. Wolverine is the Trope Namer. A lot of people forget that an early plan for Wolverine was that his gloves contained the claws. The writers eventually decided that then, anyone could be Wolverine by putting on the gloves, and made it so that they were inside his body. X-23, Wolverine's female clone. has 2 metal claws per hand, and 1 per foot. Wolverine's son, Daken, has three claws per hand: two from the knuckles, and one from the wrist. Or, at least, he used to. Wolverine tore out his wrist claws and by virtue of them having been coated with metal from the Muramasa Blade, he can no longer regenerate them. Wolverine's long time foe, Lady Deathstrike, is a cyborg with fine blades coming out of her finger tips. Marrow has the ability to grow bone blades out of her body. After having gained enough control over these powers, she copied both Deathstrikes and Wolverines blades (including snikt sound effect). Nor should one forget that in the events of The Other, Spider-Man developed poisonous hand claws stingers that he even calls a case of Logan Envy. When Peter protested that spiders don't have stingers, The Other responded that they will... in the future. Even before the Cosmic Retcon of One More Day, they weren't used much (some writers claiming that they only came out around "fellow totemic beings" as a defence mechanism). It's been revealed that Kaine The new Scarlet Spider has them as well. Romulus has four fingers (maybe) and clawed gloves - because he's based on the earliest concept for Wolverine. In the 90s 'toon, Beast had these in an altered timeline. They were part of the gloves, though. "Yeah, that will make people stop calling you the poor man's Wolverine." Basic Continuity Sabretooth has been known to sport oversized adamantium claws on the tips of his fingers on occasion. Squirrel Girl has a short knuckle spike. According to Iron Man, it's not exactly at Wolverine's level, but it's something. Interestingly, both the X-Men Noir and Wolverine Noir versions of the character keep the claws but manage to change them into something appropriate for the 1930s time period—a pair of Japanese neko de in the former and a set of special knives in the latter. In Secret Six, Catman uses a three-clawed Bagh Nakh, and Scandal has retractable forearm-mounted blades called the Lamentation Blades. The Mink from Squadron Supreme. Carnage from Spider-Man does this on occasion when preparing to kill someone because his suit can generate weapons. Catwoman, in keeping with her feline motif, uses claws on her fingertips, though smaller than most examples on this page. In Undocumented Features, "Wolvers" are the slang name for cyberclaws of this variety even before Logan is imported from a parallel Marvel Universe. He is annoyed that he can't sue for misappropriation of his name because the term's been in common use for centuries before he arrives. Freddy Krueger of A Nightmare on Elm Street used a razor-clawed glove to carry out his murders, both as the Springwood Slasher and as the dreamstalker he would become. Han uses a bear claw on his prosthetic arm against Bruce Lee at the end of Enter the Dragon. Hell-cat Maggie, a minor character from Gangs of New York, supposedly based on a real story. Used to remove ears and noses. Edward Scissorhands. Turns into a Tear Jerker when he accidentally cuts up the human hands his dying maker has made for him. In the live action Transformers movie, Tyrese Gibson sees various claw marks on a wall and notes "Was Freddy Krueger up in here?" Anthony Anderson corrects him, saying that Freddy Krueger had four blades and there are three on the wall, indicating the presence of Wolverine. The titular creatures from the Predator franchise. Their retractable claws are mounted on their gauntlets rather than their hands, though. Boltie in Super puts on Wolverine-styled claws in the film's climax. Conan the Barbarian (2011). Marique, witch daughter of Khalar Zym. One of the scarers from Monsters, Inc. has these type of claws. In the Belisarius Series, the Maratha chief Rao has an iron clawed gauntlet as one of his personal weapons. Molly Millions from William Gibson's Neuromancer (and several related works) has surgical-steel blades that pop out from under her fingernails, probably inspiring the ones in Shadowrun. In PC Hodgell's Chronicles of the Kencyrath, Jame and some other Shanir ("natural Arrin-thari") have claws instead of nails on the hands and sometimes feet. Examples are Jame (who has retractable claws on her hands), and Bear (who has fixed talons on both hands and feet). Steel-clawed gauntlets allow non-clawed Kencyr warriors to fight in the Arrin-thar style as well. Kallystine also uses a razor-ring, which only has a single blade. In Unseen Academicals, Mr. Nutt turns out to have these. Seems to be a standard feature for Discworld orcs. Cylon Centurions in the reimagined Battlestar Galactica Reimagined are built with razor-sharp fingertips that serve as claws, and can be folded back when it's necessary to handle squishy things. Kari gets a set on MythBusters for the end of the "Balloon Kid" myth. Turns out Scottie's fire breath was more effective. From the same series as Maku / Grizzaka: the Super GekiClaws / Claw Boosters. The claw is both a weapon and secondary Transformation Trinket that unlocks the team Super Mode. Kamen Rider Ryuki example. Kamen Rider Tiger, and by proxy, his Contract Monster Destwilder, both utilize clawed gauntlets as their main weapons. Similaraly the Tiger Medal lets Kamen Rider OOO use these. The leader of the demon bikers in the Season 6 opener of Buffy the Vampire Slayer. Spurs from Shadowrun were a cybernetic enhancement that gave a character a blade that sprouted from right above the wrist. Fingernail razors were a somewhat more subtle weapon that came from the fingertips. Lightning Claws in Warhammer 40,000, apparently a standard issue for Imperial Guard generals. Not to be confused with Power C/Klaws, which are essentially pointy Power Fists. Sphinx Claws in Dungeons & Dragons. Also: Claw Bracers, from the Forgotten Realms. Favoured weapon of Sharess, Goddess of Cats and Whores, also preferred by Cult of the Dragon spellcasters. Basically, daggers that can't be disarmed and leave the hands free - say, for casting fireball. Savage Species brings us the Beast Claws, magical gauntlets with clawed fingers built for use by characters with existing natural weapons. Arcana Unearthed and Arcana Evolved had the Battle Claws, exotic weapon gauntlets with claws on each finger. They were especially favored by the leonine Litorians. Exalted has mundane and artifact versions of tiger claws. They provide bonuses to climbing as well as maiming. R. Talsorian Games' Cyberpunk has "Wolvers" that act like this. "Claws" is a standard power in Super Munchkin, giving a free weapon in each empty hands. Perfect for combining with "Forewarned and four-armed" and/or "Prehensile pigtails". In Traveller, the alien race the Aslan fight duels with long knife-like claws. When a human fights in an Aslan style duel he wears artificial claws. The title character of Vexx uses these. They are also an Empathic Weapon. In MARDEK, the wolflike Aruan mage Solaar fights with claw weapons strapped to his (her? its?) paws. There's an odd example in Jade Empire. The visuals are spot on, but it's an illusion: the flavour text for the style emphasises that Leaping Tiger (for 'tis its name) is so ferocious that claws seem to sprout from the fists of the practitioner. Several fist weapons in World of Warcraft are gauntlets that have these attached to them. In one of the game's many, many shouts-out, one set can be seen sported by a wolverine-person named Loguhn. City of Heroes has the Claws power set for this, as does Champions Online. While the latter's claws are obviously similar to bladed brass knuckles, the former's look more like they come out of the character's hands. City of Heroes claws appear to come out of your hand because all weapon-based powersets, when not actively in use, are stored in Hammerspace. The actual style of the claws varies from Wolverine-style claws to spikes on the back of the hand, a long flat blade from the back of the wrist a la Assassin's Creed, and even an option for wristblades made of energy. Arachnos Blood Widows (both an NPC enemy and playable class) use both short claws and the retractable shortsword. The "claws" are really poisoned darts, which can be launched singly or in bursts. PC Widows start out with them as part of the mandatory uniform, but can evidently get surgical versions once undercover work starts turning up. In Dawn of War, the Imperial Guard hero unit is armed with retractable claws as his melee weapon. In the entries of the Final Fantasy series where monks can equip weapons, these are traditionally what they are. The Monk job and its upgrade can equip these in Final Fantasy III. Yang in Final Fantasy IV uses these as the sole weapon he can equip. In his case, claws provide only a minimal increase to his attack power, and in fact the first ones acquired don't improve it at all; they just add elemental effects to his attack. Sabin from Final Fantasy VI . Some of Tifa's weapons in Final Fantasy VII. Others are regular gloves or knuckle dusters. Amarant from Final Fantasy IX can equip these. One type of weapon you can equip in Final Fantasy Mystic Quest. Choi Bounge from the King of Fighters series. Iori Yagami, after being forcefully Brought Down To Badass Normal in XIII, now fights with his bare hands only. Even so, his hands still act much like claws, to the point that some of his attacks leave claw marks in the air. Kurow Kirishima from Project Justice: Rival Schools 2 has these. Nei from Phantasy Star II. Mieu from Phantasy Star III. Rika from Phantasy Star IV. There's an entire subclass of melee weapons in Phantasy Star Zero that are essentially this. The Garrador of Resident Evil 4, as well as the Tyrants throughout the series, G in 2, and Krauser with his mutated arm in 4. Genan Shiranui, Mai's ancestor, in Samurai Shodown. Geki in the original Street Fighter, who's said to be Vega's master. Fo from Battle Arena Toshinden sports these, as do his after-death replacements, Bayhou and Cuiling (Bayhou's nemesis). Ciel in Tsukihime emulates this trope by holding multiple swords between her fingers. As does fellow burial Church agent Kotomine in one path of Fate/stay night. Date Masamune/Azure Dragon from Sengoku Basara does this when he's drawn all six of his swords, holding three in each hand between his fingers. It gives him a more powerful moveset though he gives up the ability to defend. The Battle for Wesnoth's new Drake sprites sport Wolverine Claws - the logic being that, as clawed predators in the first place, they'll instinctively use them more effectively than more traditional weapons. Zhang He, from the Dynasty Warriors series, at least in games 3-5. In 6 he ditches the claws in favor of a remarkably generic spear, but gets them back in the PS2 version and in the "Empires" installment. Nouhime in Samurai Warriors can use these. Taokaka from BlazBlue sports a nifty pair of retractable, metallic claws. It's not clear if those are biologically hers or actually hidden weapons. The (technically non-canon, but acurate in their exposition) unlockable "Teach Me Ms. Boobies Litchi" Omakes indicate that the ability to draw her claws is a natural ability (since she doesn't have a weapon which can draw the series' Phlebotinum from the environment). Voldo and his katars in the Soul Series. His arsenal over the course of the series includes "cat claws" that play it very close to Wolverine, handheld drills, and swinging pendulum blades, minus the pendulums. The Ogre Battle series features Ninjas, Ninja Masters, and Brawlers using these in some games. Sigma from Mega Man X 2 and Xtreme 2. Also, in Mega Man Zero 4, Zero can steal claws from a certain enemy and use them himself. Dead Rising 2's ever popular Knife Gloves. Debatable. It's not quite clear whether Alex's hands turn into claws or whether his hand is still somewhere inside that claw. The Falcon Talons weapon from Ninja Gaiden II for 360 has claws on Ryu's forearms and feet. Claw-class weapons from Diablo II, though this also included katars and other punching weapons. Unreal and Unreal II the Awakening have the Skaarj, which used these for melee combat. Unreal Championship 2 The Liandri Conflict also has two playable Skaarj characters which used these claws for both melee and ranged combat, by using the same bolts their single-player parts had. Most of Yuri's weapons in the first two Shadow Hearts games are variants of this. Viath's Weapon of Choice in Tales of Graces. Sophie can use them too if you defeat Viath again in a sidequest. Some weapons in Dragon Quest series. Like in the Final Fantasy series, they're used by martial artist characters. Several of the glove-type weapons in Secret of Mana resemble these, as do several weapons used by Kevin in the sequel. In Kingdom Hearts Chain of Memories, Larxene wields her daggers in this fashion. Batman Doom has the Cheungs, long-haired Chinatown mooks who use both metal claws and shurikens against you. The Heavy Weapons Guy in Team Fortress 2 got a pair of bear hands in a later update, which he tied to his own. Helio from Last Scenario uses these. Tora in Mini Ninjas uses these to fit his tiger theme. Zuul from Sword of the Stars have "punchclaws" protruding from their forearms and extending over the back of the hand. They are vestigial in the males, but the females' are very effective at cutting through things. Bayonetta has the "durga," which can be used on the hands or feet but otherwise plays the trope straight. The second boss in Streets of Rage uses these. He's pretty fast with them too, making him a tricky fight. Two of them appear later on! WWE's Smackdown vs Raw 2006 had some Wolverine Claws you could give to your created wrestlers...and ironically, in 2011, the game where they had several super-hero items to recreate your favorite heroes (including Wolverine's hairstyle), they left the claws out. Missed opportunity of awesome? Oh, definitely. In Kid Icarus: Uprising, Pit has a melee weapon that acts as this. Fallout 3 features the Deathclaw Gauntlet, a severed and leathered hand of a Deathclaw in all its clawed glory, rigged up with various belts and leg braces into a weapon. It returns in the Lonesome Road DLC ofFallout: New Vegas as the Fist of Rawr (or with Wild Wasteland, Fist of the North Rawr) though it has to be crafted from a boss-level Deathclaw, who unsurprisingly is named Rawr. Spore Galactic Adventures has the Bladed Knuckles. Ninjas in the Time Crisis series. In Skyrim, the Stormcloak Commander uniform has spikes attatched to the gauntlets, like their mascot. It's subverted in this does no additional unarmed damage, but with the right enchantment, it could be one of the most damaging unarmed weapons in the game. In the multiplayer of Mass Effect 3, the Vorcha have Hard Light versions of these as their melee weapons. Penny Arcade has Grimm Shado, whose blades even make a "snikt" noise. And are wands, although still an obvious copy of Wolverine. Mary of Casey and Andy. Zeetha, from Girl Genius, wields her swords this way. Jager General Gargantua is a straighter example. Homestuck: Nepeta Leijon uses the clawkind strife specibus, which consists of retractable Wolverine Claws attached to her gloves. She's used two different sets of them - her normal ones and a longer, hooked blue pair obtained at some point during Sgrub. Slash Man recolour Chadling in Bob and George sports a set. At one point he merges with George, leading to one version of the villain Mynd winding up skewered on claws eight feet long, and humming with the power of a lightning god. When Greg and Lou applied for super-powers, they discovered they unfortunately could only afford to get either Wolverine's claws or his healing factor (which they previously had assumed to be part of the same power set). They opted for the claws... and Hilarity Ensues. Saluk, one of the Forty Thieves Aladdin fights in Aladdin and the King of Thieves. Oddly enough, Megabyte was shown to have both extensible claws in his fingertips and three blades from the back of the hand. Whether this is just an inconsistency is unknown, but when Megabyte was upgraded into a Trojan Horse Virus his claws were particularly gnarly. The Shredder from Teenage Mutant Ninja Turtles has gauntlets with two clawlike blades on the back of the hand that he uses as weapons. His suit is full of blades and quite dangerous-looking, leading to comparisons to a can opener by Michaelangelo when they face him in The Movie. Oddly enough, it's only that one pair of claws that are ever used as a weapon. The rest of his suit is apparently decorative. Let me tell you something, Television Tropes & Idioms! Rath might only have one claw per hand, but if you make Rath mad, they can mess you up plenty! Some examples of "tekagi-shuko" claws used by feudal ninja do resemble this, being worn on the back of the hand with extended claws. They were principally a climbing tool but could also be and likely were used as a weapon in a pinch. The better known nekode design, with short spikes worn on the inside of the palm, appears to have been more common. The arthroleptid frogs puncture their skin with their fingerbones to create defensive claws. Fantasy collectibles along these lines are called "hand claws." ↑ Actually, the other way around. The contract monsters generate the weapons. The claws that appear when he uses Strike Vent are 100% identical to Destwilder's natural claws for this reason. All beast-gained weapons are similarly identical to parts of the beasts they're given by, and it was actually originally thought that these parts of the beasts detached to become the weapons (a la the toys.) However, later episodes show the beasts intact even as weapons are being used. Which is good, as Ryuki's Strike Vent is Dragreder's head, and Dragreder kinda needs that. This page was last edited on 27 December 2018, at 02:34.